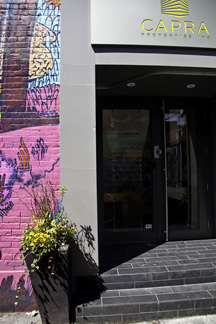 Graffiti: An art gallery in the backstreets of Toronto. The visual arts relate to the “state of mind.” First what it means to the artist and then to the observer. Art is personal. No one can ever truly understand what the piece means to the artist and each individual looking at the art work will have a different understanding and relationship with it. Most art is meant to be removed from the space of its creation and placed in a new space, which can give it a whole new meaning as it interrelates with the environment around it. Graffiti Art is meant to stay where it was created having been created in the environment that it relates too. It is also understood that with the elements and human interaction it will not last forever. Wait…Graffiti Art? Isn’t graffiti something that gangs use to designate territory? No…not really. Graffiti began as a way of “tagging” a name—a way to be noticed. Many see this as vandalism. It makes a neighborhood look cheap and messy. In answer to this a few years ago the city of Toronto declared a war against graffiti. When a war is declared a battle ensues. No one was winning (or maybe the City was loosing) so a “treaty” was finally made between the city and the street artists. Graffiti was categorized into two areas: Graffiti art, which is created with permission, and graffiti vandalism, which is not done with permission. Property owners are responsible for removing the graffiti vandalism if there is a complaint or they will be fined. 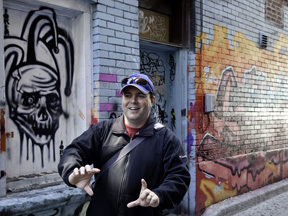 Property owners can also hire local graffiti artists to create an art piece on their building. 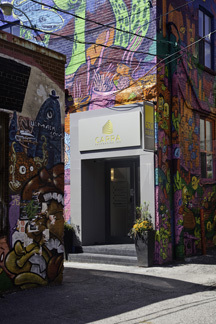 As a result to this Graffiti Art has grown and developed in the back allies and streets of some of the neighborhoods of Toronto—these back allies and streets have become an outdoor gallery for all to discover and hopefully enjoy. Commissioned art work for Capra. It was spayed with wax to keep any one from writing over it. 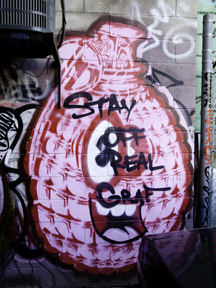 Graffiti is about community: The relationship of the artists with the neighborhood. Most artists are young, in their teens, many are boys but girls are involved too. They live in the area and can give something creative to their neighborhood. Some artists even continue into adulthood, having had a chance to explore and develop their art as youths and gain respect as a serious artist who now receives commissions. Walking down these alleyways and looking at the art as though one was in a gallery: sunlight or shadow hitting the vibrant colors and forms—a new appreciation to this grassroots art develops. 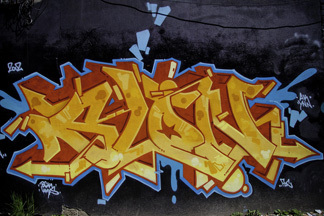 Throws/Throw-ups: a name written in bubble letters in two colors. Piece: More than 2 colors are used. The city recognizes this as art. The more elaborate the piece the more respect the artist has. Also the higher up the wall the work is done the more respect. Force Line: a bright line around the piece that creates a boundary. Bitter: copying someone else’s style. Toy: someone who copies or sprays over someone else’s work. Special Thanks to Jason Kucherawy of www.tourguys.ca, Tourism Toronto, Ontario Canada, and TBEX Toronto 2013. Been working on prints with some of the photos too and made post cards. Working this weekend with Geannina at Comicon so will see how it goes.